Yesterday, October 4, turned out to be a field day for all altcoins as they rose against the bear and gave the power back to the bull for some time. This marks a significant rise as most of the coins broke their short-term resistance levels despite the biggest cryptocurrency, Bitcoin’s continued support to the bear. Litecoin [LTC] and Monero [XMR] also showed that they prefer the bull’s rule over the bear’s as the coin glowed green in the market. According to CoinMarketCap, at press time, Monero, the ninth-largest cryptocurrency, was trading at $110.67 with a market cap of over $1 billion. The coin saw a surge of 4.35% in the past 24 hours, with a trading volume of over $15 million. The highest volume was spotted to be Bithumb, with XMR/KRW trading pairs. The second highest volume was from Binance, with XMR/BTC trading pairs. 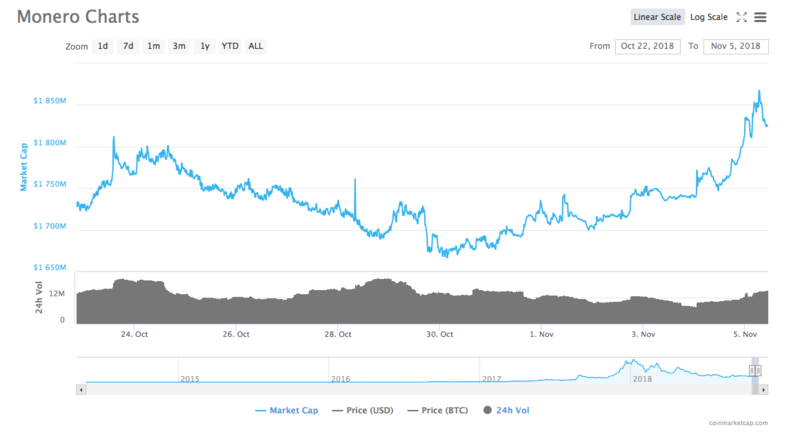 The coin was trading at its October 2018 value, prior to the drop on October 18, 2018. Monero’s hardfork, Beryllium Bullet took place on October 18, 2018. This upgrade mainly concentrated on implementing Bulletproof technology, and also to decrease the transaction fees and increase the anonymity. The hardfork was executed on block 1685555 and the new version went live on block 1686275. Post this, the transaction fees dropped to almost 2 cents and all the leading exchange platforms announced that the fees has been reduced to 0.0001 XMR. Litecoin [LTC], the seventh-largest cryptocurrency in the market, was trading at $53.75 with a market cap of over $3 billion. The coin saw a surge of 4.47% in the past 24 hours with a trading volume of over $46 million. The highest volume of the coin was recorded on Bithumb with LTC/KRW trading pairs and the second-highest volume of pouring in from DOBI Trade with LTC/BTC trading pairs. The post Monero [XMR] and Litecoin [LTC] rise in the market to show their support for the bull appeared first on AMBCrypto.